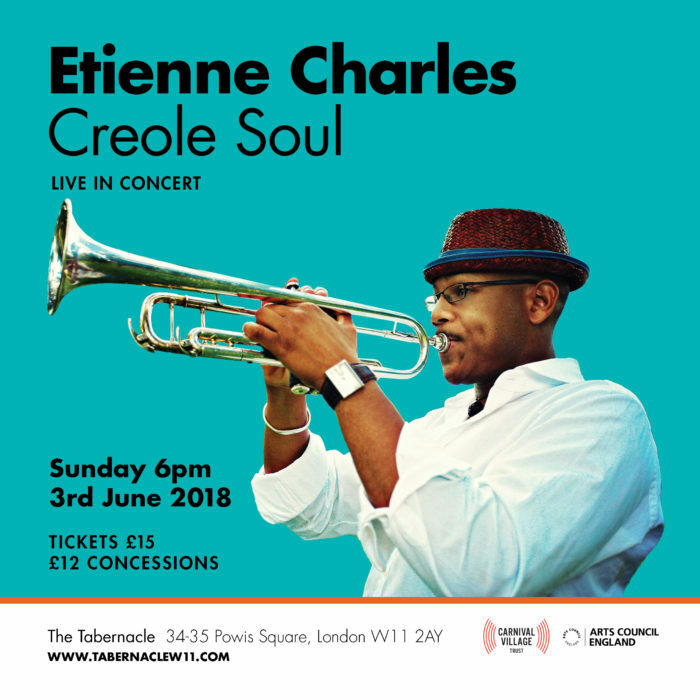 Caribbean history and culture will be interpreted through music when acclaimed Jazz trumpeter Etienne Charles returns to London on June 3. The Trinidadian musician, who has played for sold out audiences in his homeland as well as in Japan and the US, will take his London audience on a musical journey to discover and appreciate the cultural roots of the Caribbean. Charles last played in London in 2012. Since then, he has released five albums – Kaiso, Creole Soul, Creole Christmas, San Jose Suite and Carnival, the Sound of a People. He is eagerly awaiting his return. “When I think of London, I think of the significant contributions of some great pioneers from our shores here in the West Indies: people like Lord Kitchener, Mighty Terror, Edric Connor, Russ Henderson, Fitzroy Coleman, Rupert Nurse, Sterling Betancourt, Boscoe Holder, VS Naipaul, Errol Ince, Shake Keane, Cy Grant and so many others. It’s an honour to come play at the Tabernacle in Notting Hill where our culture has thrived and continues to grow, engaging people far away from the Caribbean and educating generations about their heritage,” he said. Hailed by The New York Times as “an auteur” (Ben Ratliff) and by Jazz Times as a, “daring improviser who delivers with heart wrenching lyricism” (Bill Milkowski), Charles has received critical acclaim for his exciting performances, thrilling compositions and knack for connecting with audiences worldwide. Raised in a musical household where calypso, soca, folk and steelpan music coloured his musical experience, Charles started playing the trumpet at the age of 10. His musical skill was later honed in the US where he graduated with a Bachelor’s of Arts degree from Florida State University and a Master’s of Music degree from The Juilliard School of Music. Charles has appeared on stages with notable musicians including Wynton Marsalis, Monty Alexander, Gerald Wilson, Roberta Flack, Frank Foster, the Count Basie Orchestra, Maria Schneider, Johnny Mandel, and Benny Golson. In 2006, Charles won the National Trumpet Competition, Jazz Division. That same year, he released his debut album, Culture Shock. By the time Folklore was released in 2009, Charles had formed his own touring and recording band. In 2009, he began teaching at Michigan State University’s College of Music as an Assistant Professor. In 2011 he released his third album, Kaiso. He released his fourth album, Creole Soul, in July of 2013 and was awarded the Caribbean Heritage Trailblazer Award by the Institute of Caribbean Studies. In 2015, he paid homage to Caribbean Christmas melodies on the album Creole Christmas and after touring three San Jose cities, he produced the San Jose Suite in 2016. In 2018, Charles officially premiered Carnival, the Sound of a People, composed after four months of travel and deep research across Trinidad and Tobago to unearth the arts of Carnival that highlight the vivid and vast elements of the culture. Charles has won numerous awards including the Jazz at Lincoln Center Millennial Swing Award (2016), Florida State University Reuben O’D Askew Young Alumni Award (2016), Michigan State University Teacher Scholar Award (2016), John Simon Guggenheim Fellowship in the Creative Arts (2015), Caribbean Heritage Trailblazer Award (2013), US Congressional Record (2012), The Juilliard School William Schuman Prize (2008). In 2018, Charles won the NAACP Image Award for Outstanding Jazz Album after serving as an associate producer on Somi’s “Petite Afrique” (Sony Music/OKeh). Charles co-wrote five songs on Petite Afrique (the Gentry, Black Enough, Let Me, Midnight Angels and They’re like Ghosts) as well as arranged strings, horns and played percussion and trumpet on the album. Charles currently serves as Associate Professor of Jazz Trumpet at Michigan State University in East Lansing. Etienne Charles Creole Soul will be held at The Tabernacle, 34-35 Powis Square, London W11, 2 AY. Tickets are £15.